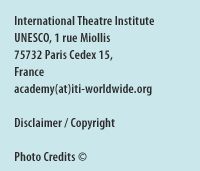 “Theatre in Conflict Zones” is a project developed by the president of the Sudanese Centre ITI and Vice-President of ITI worldwide, Ali Mahdi. In 2004 he went to Darfur with a group of theatre workers, in the midst of a tribal war and tragic conflict. The theatre workers started to present their play, with the active involvement of the audience, which included people from both fighting sides. Their performance grew into an unexpectedly large event where both sides in the conflict were not only watching but also participating (even soldiers and police). During the event there was also an agreed ceasefire. Since this important success, the project “Theatre in Conflict Zones” has been to Darfur regularly and continues its work. It does not only train people in acting and directing, it also brings to the people of Darfur medication, food and assistance. The project started with one of the ITI committees, called the Cultural Identity and Development Committee (CIDC). 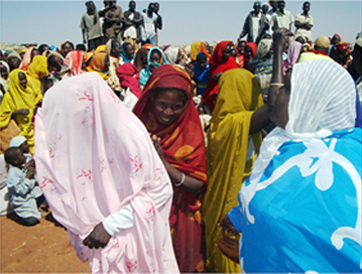 The main assistance came from the Sudanese and German Centre of ITI. The German parties are involved in theatre educational support – sending theatre professionals to Sudan or inviting Sudanese actors for workshops and courses to Germany. Since 2005, a Centre for Theatre in Conflict Zones has been established in Khartoum, Sudan, under the leadership of Ali Mahdi. The “Femmes en Scène” ("Women on Stage") project was developed with women from over 17 African and Caribbean French-speaking countries as a response to the general lack of women artists in the theatre scene. Supported by UNESCO and by the European Union, Femmes en Scène is led by the Ivory Coast ITI center. 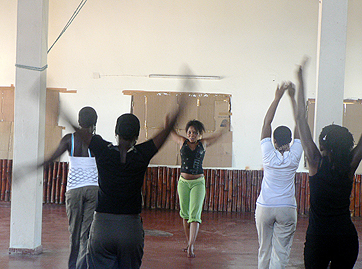 Since 2004, over 140 women have followed two months of training in playwriting, set design, direction, technical direction, and acting with African, European and Caribbean trainers. The last edition of the residency in fall 2009 brought together participants from Benin, Burkina Faso, Cameroon, the Central African Republic, Chad, Congo Rep., Guinea, Guyana, Ivory Coast, Mali, Niger, Togo, Rwanda and Senegal.